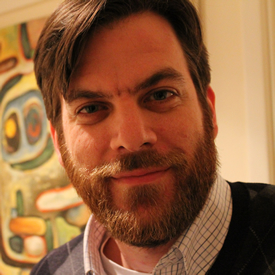 He is currently Reader in Human Geography at University College London. I think the two main themes of the book are genre, and of course geography. The book is about the nationalist superhero genre, which I argue originates in a particular space and time which shapes the stories that get told. The genre itself is unabashedly and unironically flag-waving and centred on righteous, redemptive violence, with the violence of ‘superpowers’ in the comic book mirroring the righteous, redemptive violence of ‘superpowers’ in the international realm. Both kinds of ‘superpowers’ purportedly operate outside of a legal framework to protect that framework. The second theme of the book is geography – not only the centrality of the nation-state to this particular national imagination but also the way the genre has had to change as it moves to Canada and the United Kingdom, which have different relations to nationalism and legitimate violence. 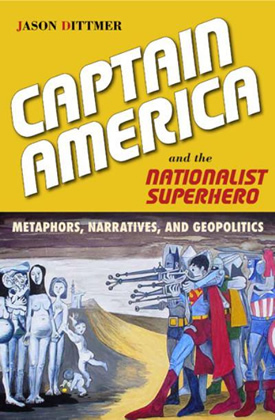 The book is interested in looking at the specific ways in which the nationalist superhero genre reproduces or challenges particular notions of the nation-state in the geopolitical world, such as the gendering of international relations, and the connection of the nation to specific territories or world orders. It also, as mentioned above, tries to examine the ways in which these techniques change as the genre moves into new national contexts. Methodologically, I read about a thousand comic books. These were of nationalist superheroes from 1940 until the present, in the US, UK, and Canada. Of course I did not read them all – in fact I specifically framed my definition of the genre to exclude Superman because that would have added about another thousand comics and this project took long enough already! Of course, paying attention to the narratives was important but so was understanding the circuit of relationships that sustained the comic – so I analysed fans’ letters to the editor and also interviewed writers who wrote the stories so that I could understand this pop culture not just as a set of stories, but as an interactive process. The genre conventions are remarkably stable and conservative. I have a chapter about time travel. The literature in science fiction studies holds that time travel is an opportunity to up-end social norms, but what I find is that even in these situations where the writers can do anything, they end up affirming the centrality of the nation-state. Similarly, I have a chapter about subversions of the nationalist superhero genre (e.g., Captain Confederacy) which are generally limited in their scope of critique and commercial viability. Having said that, my research also shows that readers can and do find all sorts of political meaning from these texts that go way beyond what the writers intend. That’s why it is important to remember that culture is an open process. Well, it is (to my knowledge anyway) the first book length study in popular geopolitics since Jo Sharp’s magisterial Condensing the Cold War in 2000. I think it pushes popular geopolitics further not just in its scope but its methodological rigour and sophistication. Popular geopolitics has been really good at deconstructing representations but pretty shallow in terms of tracing production and consumption and linking it to those representations. This book shows how this research can be done more holistically. Finally, the book is good fun, I hope! Well, I did my PhD dissertation on news media and NATO/EU expansion in the 1990s and early 2000s, and moving into popular culture was an obvious move afterwards. I had read Captain America when I was in my early teens and I remembered enough to know it would be a good project! Now I have a file cabinet full of comics for whenever I have kids. Well, I think genre is a fruitful concept to take forward, and I thank Klaus Dodds for flagging it up for me several years ago. If there is something I wish I had done more with, it is the way the comic book companies have produced massive, interlocked worlds of narrative. These worlds are ornate and geopolitical, and someone ought to – instead of focusing on individual heroes as I have done – focus on the imagined worlds in which they collectively live. That would be a great read!